Designed with superlative vocal reproduction in mind, the KMS 105 brings Neumann quality to the demanding sound reinforcement environment. With its supercardioid polar pattern, low self noise, and uncolored off-axis pickup, the KMS 105 complements in-ear monitor systems. By employing a unique 4-layer acoustic filter, the KMS 105 minimizes popping and wind noise, and with special mechanical and electrical filters, handling noise is virtually eliminated. Because of the superior resolution and linear frequency response, it is very easy for the artist using the KMS 105 to identify whether he or she is "on mic." The Neumann KMS 105 has become an internationally recognized standard in the field of high-quality stage microphones. 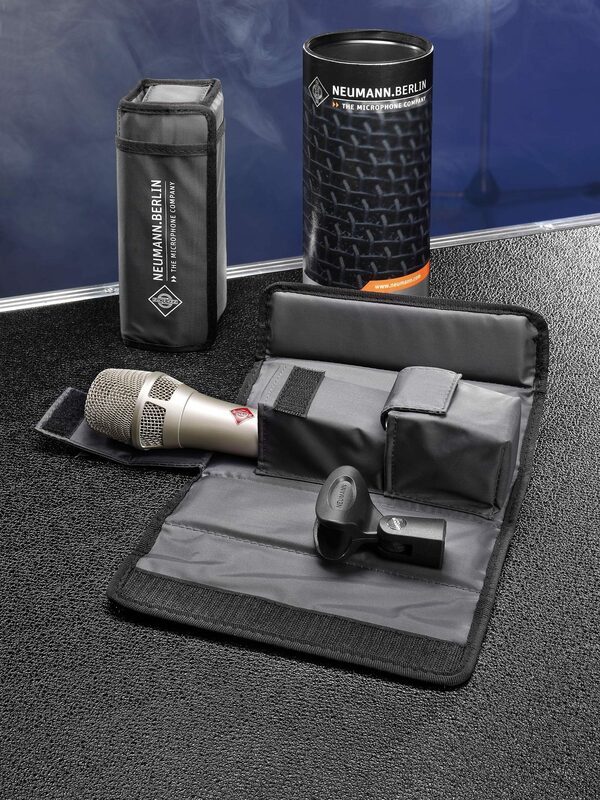 An excellent vocal mic that truly gives the Neumann Sound on stage, it excels as a live and studio microphone for speech, acoustic-stringed instruments and brass. Very high SPL capabilities, low handling noise, a tight supercardioid polar pattern, excellent feedback rejection, and uncolored off-axis response make this a professional choice that is easy to use and a pleasure to record with. Compared to other handheld vocal microphones, the KMS 105 offers a superior resolution of the voice, with extended frequency response and accurate transient detail. Sibilance problems common to other handheld condenser mics are eliminated. No foam is used in the basket, thus eliminating any "clouding" or "muffling" of the sound. Also, by using a DC-polarized studio condenser capsule, all the nuances of the voice come through with subtlety, power, and focus. With its supercardioid characteristic, the KMS 105 is particularly good at suppressing sounds originating from the entire 180-degree hemisphere behind the microphone. The K 105 capsule was developed from the K 50, found in the KMS 150, KM 150, and KM 185 microphones. The K 105 features a supercardioid pattern, achieved by specially modifying the response of the K 50 pressure gradient transducer. The frequency response characteristic is developed in the acoustic realm, allowing for accurate representation of transient details found in music and speech, and thus transmitting a very "open" and detailed capture of the human voice. Due to the tight supercardioid polar pattern and the coloration-free off axis response, a very high level of gain before feedback is achieved. This polar pattern offers the highest degree of isolation while still allowing for a generous "sweet spot" in front of the microphone. The dynamic range of the KMS 105 is 132 dB, allowing reproduction of the artist's full expression, without restraint. The maximum SPL is 150 dB and with a low self noise of 18 dB-A, a greater gain can be used without risk of adding noise to the mix. This way, the artist is able to use the microphone at a greater distance -- therefore maintaining a wide range of creative freedom during the performance. Because of the superior resolution and linear high frequency response, it is very easy for the artist using in-ear monitors to identify whether or not he or she is "on mic" with the KMS 105. And by employing a transformerless output circuit, this microphone can incorporate long cable runs with no loss of signal quality or high-frequency response. Most of the available vocal microphones rely on the attenuating effects of foam layers inside the basket. Although this is certainly a cost-effective procedure, the detrimental effects of this foam layer can be shown quite easily. Treble frequencies are attenuated, and furthermore the polar pattern can be deformed. These drawbacks can be eliminated by selecting open mesh constructions. With careful dimensioning and selection of different mesh sizes, excellent pop and wind attenuation can be delivered, as is well known from the standard studio-use pop screens PS 10 and PS 20, made of 2 layers of spaced fabric. In the KMS 105 a combination of 4 wire meshes with different mesh sizes is used. The chosen combination yields a very constant polar pattern, while maintaining the capsule's acoustic frontal frequency response. Naturally, the outer microphone basket is hardened steel, due to the required ruggedness for on-stage use. "It's a whole new world"
Overall: There are some very good dynamic mics for playing live, I don't dispute that. I read reviews on all of them and those reviews were not unanimous favoring any single mic, so I kept reading. 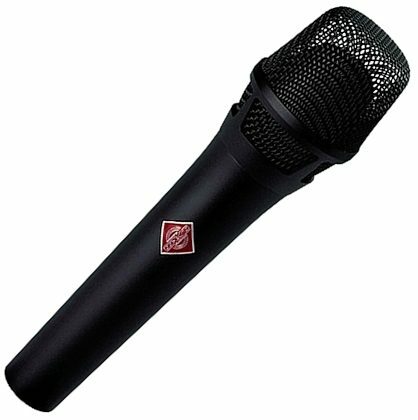 After many years in broadcasting and voice over work, I always found Neumann mics to be favored in the larger studios, many Sennheisers too; so I started looking at those brands with the thought that if I could get a condenser for stage use, that is what I would do. Enter the KMS105. It was like taking a pillow off my voice. I love this mic and use it at every gig with NO problems, period. You will have to do a couple things before your experience is what you hope for. First, you'll need to know that you don't have to eat the mic, second, you'll want to record yourself and perhaps work on some things like how you end words. DO work with it before you take it out, you WILL find things in your voice you didn't know were there; good and bad - it brings them all out. The best thing I can say though is, this is an instrument that you will want to learn to play and play well. It will change your entire performance for the better. It will add clarity and quality and the words will cut through the mix so everyone will enjoy your show. I use in-ear monitors and I sometimes catch myself listening to them and smiling during a song because this mic sounds that good. Style of Music: Country, pop, classic rock. Sound: Folks, don't believe those negative reviews on this microphone. I get the feeling someone from Shure is impersonating a disgruntled customer so they can get people to buy their Beta 87's. Lol. I've used this microphone and I can tell you it is the best handheld mic out there for that price. I do studio recording at home and I'm baffled by the level of clarity this mic has. I regularly use a Rode K2 on an Avalon 737sp and I have excellent results, but when I need something handheld to get more of a 'live' sound effect, this is my go-to mic. I own other mics (including the Shure Beta 87) and this is simply the best handheld in my arsenal. I've also used it on live shows and it sounds fantastic! The built in bass roll off is definitely a plus! When you have a high quality pa system & speakers and are looking to get a more accurate sound instead of a fake boomy proximity effect you get on the others, then this is the perfect mic for you. This is a FULL range mic that sounds very glassy!...and there's a very unique sparkle around the 10Khz region that makes me want to drop my pants and make love to it. You just have to hear it to understand. Feature: Comes with a case and a mic clip. Ease of Use: Simple to use, just plug it into a phantom powered preamp and go. Quality: It's a Neumann. Value: The price is very reasonable considering it's a Neumann. Manufacturer Support: I've never needed support from them. -- They have a good reputation for taking care of their customers and I have peace of mind. The Wow Factor: The black one in particular is NOT a flashy mic. Big flashy silver mics are a distraction for the listeners, especially when you wear a dark colored suit. This mic hides itself pretty well against your evening attire. Overall: I would definitely replace this mic is it was ever lost or stolen. Same brand, same color, same model number. Style of Music: Pop, Lounge, R&B.